LOCATION: Christopher’s Martini Bar, 18 Wellington Street, WC2E 7DD [map]. 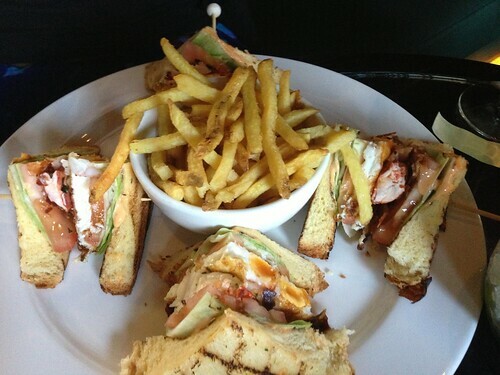 FILLING: Lobster, bacon (according to the menu), fried egg, iceberg lettuce, tomato. PROS: The brioche is nice. It can’t not be, really, containing as it does all that lovely butter. CONS: It’s not even really worth my ranting about the fact that the tomato is insipid, the fried egg completely overwhelms the lobster, the advertised bacon is entirely absent, and the chilli mayo is like something that turns up with your chips at GBK. It’s not really worth my even beginning to be upset about all those things because there is one monumental piss take happening here and that is the fact that each triangle, each quarter of the sandwich, contained 1 tiny piece of lobster; I’d say 4 pieces barely the size of a postage stamp and I mean the small ones, no special edition stamp sized pieces of lobster here. The sandwich is £22. TWENTY TWO POUNDS. Someone must be laughing all the way to the bank while relishing the fact they’re dressing all the customers up like total mugs. It’s frankly outrageous money for what is essentially a fried egg and salad sandwich with posh bread. What makes this even more wincingly, acutely painful, is the fact that the lobster has been shonkily prepped; my mate gets a nice long piece of claw cartilage with his bit. Bigger than the piece of lobster meat it comes with. It’s not a one off either, as we can see from this review in The Independent. The kitchen consistently can’t be arsed. And finally, just in case I haven’t discouraged you enough from ever ordering this sandwich, let’s consider that for two pounds LESS, you could eat a WHOLE LOBSTER, perfectly cooked, served with melted butter, chips AND a salad at Burger and Lobster on Dean Street. They make a much better martini too.